Ultralight nylon ripstop Pertex Quantum® GL shell with a DWR (durable water repellent) finish. Sheds precipitation, blocks wind and allows insulation to remain fully lofted and warm. 65-g PlumaFill insulation replicates the structure of down in a lofty synthetic with warm-when-wet performance. The unique construction of PlumaFill insulation stabilizes the fibers to prevent shifting, clumping and cold spots associated with down or other synthetic down alternatives. For next-to-skin comfort at the chin, the center-front zipper has a wicking interior storm flap and a zipper garage. Two welted zippered handwarmer pockets; left pocket doubles as a stuffsack with a reinforced carabiner clip-in loop for attaching to a harness or pack. Ultralight binding at hem and cuffs seals out drafts and locks in body heat. Down vs Synthetic — this has been the debate ever since people started stuffing their jackets and blankets with something other than bird feathers. But last year, Patagonia introduced their Micro Puff Hoody, and this little piece aimed to upend the terms of the entire debate. Historically, down has reigned supreme for its unmatched warmth-to-weight ratio. But it still falters in wet conditions, where it loses nearly all of its insulative value. Water-resistant treatments have curtailed down’s loss of loft when wet, but synthetic insulations still offer much more reliable warmth when soaked. Down also comes with the ethical and environmental concerns associated with raising and killing (or in some particularly rough cases, live-plucking) geese for their down. So people have had to either use down pieces that were warmer for the weight but were not ideal for wet conditions, or wear heavier synthetic options. Patagonia claims that their Micro Puff Hoody actually has the highest warmth-to-weight ratio out of all their insulation pieces — down or synthetic. So both Sam Shaheen and I have been testing the Micro Puff Hoody to get an idea of its warmth, offer some comparisons, and see how “revolutionary” this piece actually is. The Micro Puff Hoody utilizes a 10-denier nylon ripstop Pertex Quantum GL fabric for both the face and lining, and Patagonia says that it’s the lightest fabric they’ve ever used. 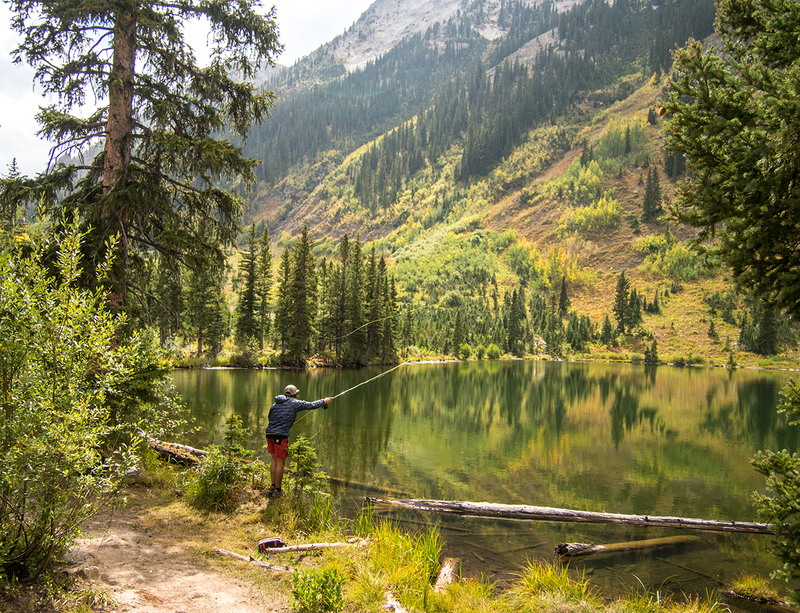 The fabric is definitely designed for absolute minimum weight, and it strays away from the materials used in comfortable, stretchy insulators like the Patagonia Nano-Air Hoody. Compared to those fabrics, the Pertex Quantum GL feels stickier on skin and more crinkly, as most tightly woven, downproof fabrics do. However, the Micro Puff’s fabric slides easily over and under layers, and feels just fine if it’s not touching sweaty skin. 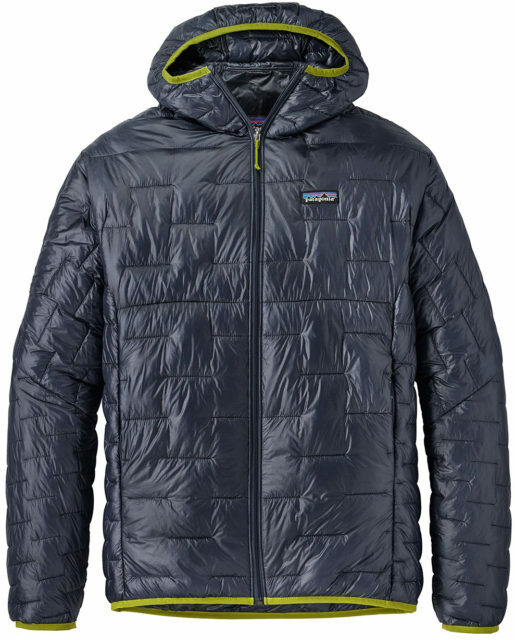 Combined with the airy PlumaFill insulation, the ultralight fabric makes the Micro Puff Hoody feel very much like the Patagonia Ultralight Down Hoody, which uses a similar 10-denier fabric, but utilizes 800-fill-power down rather than a synthetic insulation. 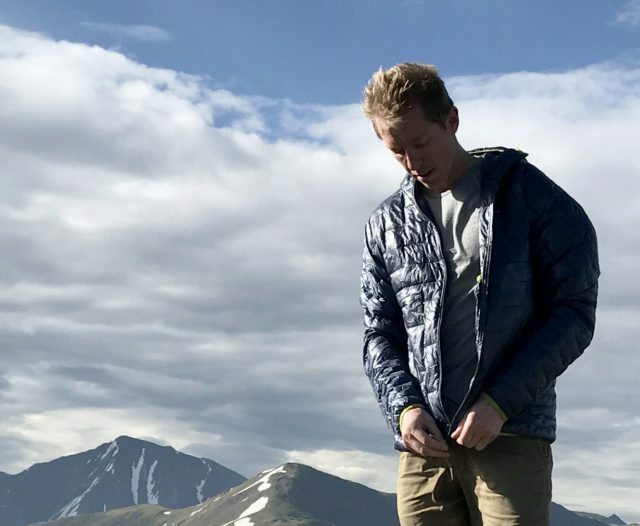 The Micro Puff Hoody’s fabric is also noticeably thinner, lighter, and shinier than the 22-denier polyester face fabric of the Patagonia Nano Puff Jacket. The Micro Puff Hoody’s PlumaFill insulation consists of long, thin, hair-like fibers (thinner than a human hair) that are wrapped around a stabilizing fiber. This results in a very light insulation that lofts very high — Sam has even been losing a few “feathers” like you would with an analogous down garment. However, he was by no means losing a significant amount of insulation, and Patagonia has clarified that this is likely limited to the pre-production samples we tested, and should not happen with production versions. The patent-pending construction on the Micro Puff Hoody is also unique, and consists of a discontinuous pattern of sewn-through lines where there are no completely separated baffles, but rather a series of offset stitches. This construction implies that the PlumaFill insulation has fewer issues with migration than down and other non-batted synthetic insulations, and Patagonia claims this construction creates fewer cold spots. This unique construction is also a significant part of the aesthetics of the jacket. It’s minimal, unique, quilting allows for plenty of loft, and is a welcome departure from the huge horizontal channels found on most down pieces. The Micro Puff Hoody has a roomier fit than most other technical, alpine-cut pieces that we’ve reviewed (e.g., the Patagonia Nano-Air Light Hoody, Outdoor Research Ascendant Hoody, North Face Radium Jacket, Marmot Alpha Pro, etc.) but it’s a bit slimmer than the Patagonia Nano Puff Jacket and the standard Patagonia Down Sweater. This moderate fit makes the Micro Puff Hoody a bit more versatile than tighter midlayers in terms of additional layering, and it’s roomy enough to toss over another layer or a slim shell. Sam Shaheen in the Patagonia Micro Puff Hoody, Mt. Bethel, CO.
Sam and I both wore the Micro Puff Hoody in a size Medium, and agreed that it has a pretty standard torso and sleeve length. The hood is big enough to squeeze over a climbing helmet, but it won’t fit over a ski helmet (Patagonia advertises the hood for under-the-helmet use). The Micro Puff Hoody has a bit of extra room just about everywhere. Sam has been wearing it with the Nano-Air Light Hoody underneath, and that combo fits together great. If you’re looking for a streamlined insulator to wear only over a base layer, the Micro Puff Hoody might be a bit roomy, but we don’t think that the fit will be a deal breaker for many people. The Micro Puff Hoody has two deep, interior drop-in pockets, two zippered handwarmer pockets, and a simple elastic binding on the cuffs, hood, and bottom hem. One of the handwarmer pockets doubles as a stuff sack, and unlike many stuff pockets, it has plenty of room to pack the jacket within itself easily. This means that the Micro Puff Hoody looks rather large when stuffed into its pocket, but since it is by no means fully compressed, you can cram it into any open space in your pack and it will smash down even further. The final compressed size of the Micro Puff Hoody is less than a liter, and the stuff pocket has a solid webbing loop to clip to a harness or pack. The Micro Puff Hoody has the best warmth-to-weight ratio of any synthetic midlayer we have ever used, which includes pieces that use insulations such as Primaloft Gold, Coreloft, Polartec Thermal Pro, Polartec Alpha Direct, VerticalX, and Thermoball. The Micro Puff Hoody is also the closest synthetic we’ve used when it comes to replicating that lofty, down-like feel. 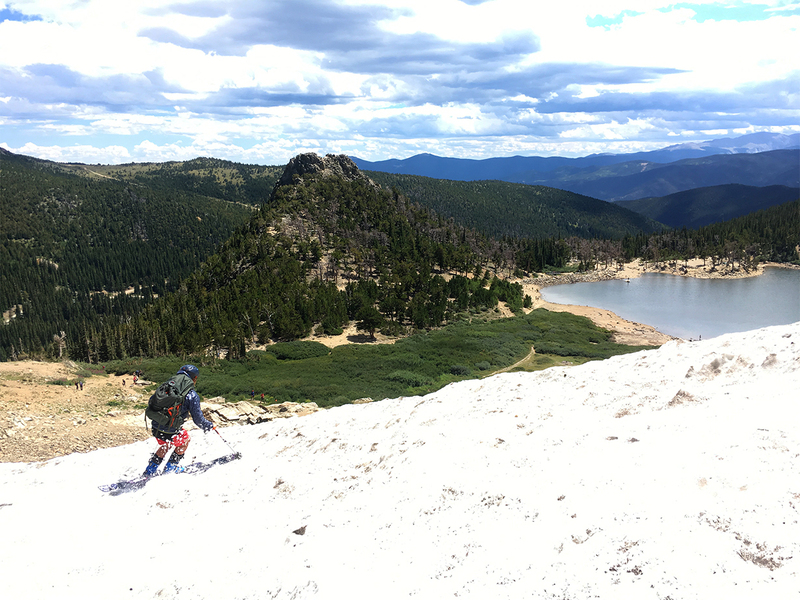 Luke Koppa in the Patagonia Micro Puff Hoody, St. Mary’s Glacier, CO. Unfortunately, we’ve so far only tested the Micro Puff Hoody during the summer, so we haven’t had a chance to get it in temperatures below ~40°F, but in these conditions the Micro Puff Hoody has felt significantly warmer than the Patagonia Nano Puff, and we’ll soon be comparing the Micro Puff to some of its down competitors. The objective warmth of a garment is difficult to gauge, but from our experience so far, the Micro Puff Hoody does indeed seem to be a significant step forward in the realm of synthetic insulation, and we are looking forward to testing it in colder conditions. The Micro Puff Hoody is constructed similarly to most down pieces, with a thin, tightly woven face fabric that’s treated with a DWR finish. Because of this, the Micro Puff Hoody’s weather resistance is fairly predictable — it blocks the majority of wind (though not all of it due to the sewn-through construction), a small amount of light precip (before the DWR wets out on the shell fabric) and a decent amount of snow in the winter. The shell fabric on the Micro Puff Hoody is very thin, which does present some durability concerns, but it hasn’t seemed to affect the weather resistance of the piece adversely. The real test of durability will be over the next several years while we see how quickly the PlumaFill insulation breaks down. One of the primary benefits of down insulation is that it tends to last a bit longer than synthetics since the feathers don’t break down as fast as the more brittle synthetic fibers. Only time will tell, but we’ll be sure to update this review as we get a better feel for PlumaFill’s durability. The face fabric of the Micro Puff Hoody is also extremely thin, and obviously not meant to deal with a whole lot of abrasion. 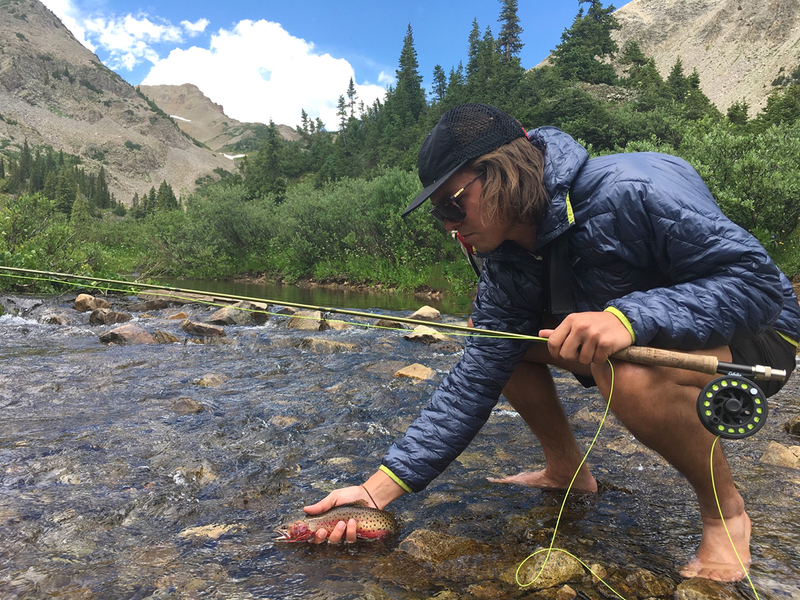 Luke Koppa in the Patagonia Micro Puff Hoody, Crested Butte, CO. In general, though, after about seven days each in the piece, neither of us have had any durability concerns. The shell fabric on both of our hoodies is in perfect shape after being repeatedly stuffed into and out of full packs, rubbing against trad-racks, backcountry cooking supplies, snacks, etc. So far, the Patagonia Micro Puff Hoody has proven to be a very efficient insulator, more so than any other synthetic midlayer we’ve used. Its minimal features serve their purposes, and the fit makes it an option for use both underneath or outside of a shell. We need to spend more time in the Micro Puff Hoody to get a better sense of its durability and performance in colder conditions, but so far, it looks like it could be the best option out there if you’re looking for an ultralight midlayer that will stay warm even when things get wet.